This floral tapestry "Bouquet Exemplar Beige" shows a gorgeous bouquet of flowers and tulips on an urn on an ancient pedestal. Here in this piece, we see a wonderful arrangement of flowers including roses, peonies and variegated tulips, in a copper colored urn, perched on a white pedestal column. The color palette in this piece is beautiful in its shades and tones, where the various flower colors combine so well, as with the foliage. 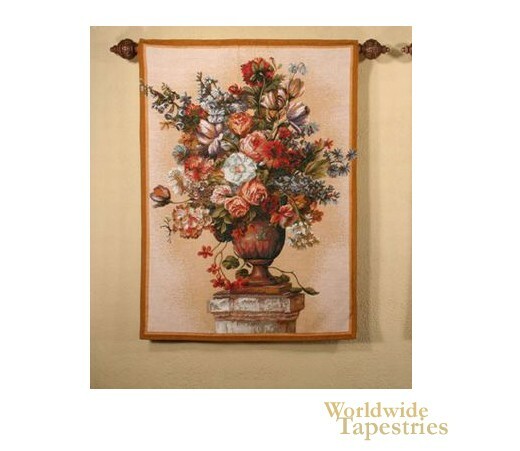 This French floral tapestry "Bouquet Exemplar Beige" is backed with a lining and has a rod pocket for easy hanging. Note: tapestry rod, where pictured, is not included in the price.